You know that party you went to on Friday night? That party didn’t just have implications for your liver. 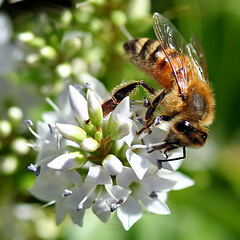 A recent paper about honeybees suggests that an organism’s social activities can modify its DNA. This study is part of a burgeoning field called epigenetics—the study of how early life stress, chemical exposure, and other conditions can change the structure of DNA in certain genes. These changes don’t change the sequence of genes but rather change the levels of expression of these genes. What is particularly intriguing about epigenetic changes is that they can be passed on from generation to generation. In fact, an earlier study showed that the level of fearfulness that a rat exhibits can be due to the maternal care that that rat’s mother experienced (meaning that your grandmother’s parenting behavior that affected your mother’s childhood could be encoded in your DNA). There are a few particularly novel and interesting elements to this honeybee paper. For example, most previous studies examined how negative behaviors induce epigenetic changes, whereas this paper explores how normal social behavior influences DNA methylation (a certain type of epigenetic change). The authors found significant differences in the methylation of brain-expressed genes in bees that were acting as nurser bees versus forger bees, even when these bees were the same age and from the same hive. The social activity-dependent methylation differences were much larger than the age-dependent differences in methylation, adding support to an existing idea in the honeybee field: that “cognitive age” as defined by the social role an individual bee plays is more important than “chronological age”. Another interesting element of these findings, is that there were significant colony-specific differences in DNA methylation between different hives. The authors suggest that these accumulating epigenetic differences between hives may help to explain how colonies of honeybees behave like superorganisms.